What happens when your wife wishes to expand your limited circle of friends? She decides to make arrangements to do some “couple dating” and invites each of three separate and decidedly different couples to spend an evening in your home. The result is a boisterously entertaining comedy about love, marriage, friends and contemporary relationships. Couple Dating tells the engaging story of Tess and Bobby Marotta, a thirty-something couple living in Brooklyn. Tess and Bobby have been married for five years and have a three-year old daughter. After watching a segment about “couple dating” on NBC’s The Today Show, Tess decides that they need to explore new friendships. As each couple spends an evening in the Marotta home, the audience learns more and more about whether Bobby and Tess will find what they are searching for among their new friends or whether they will decide that their old friends are not so bad after all. 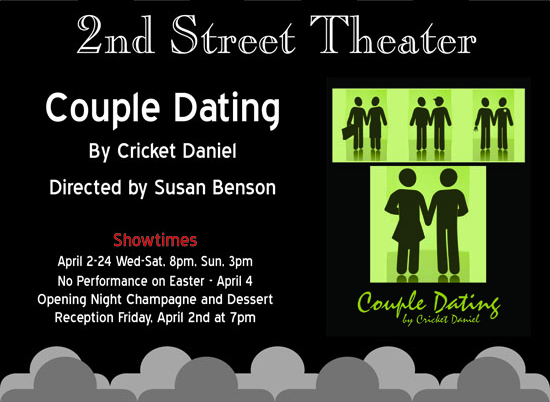 Couple Dating is an edgy contemporary comedy in which you will recognize yourself, your friends and the various couples that have come and gone over the course of a lifetime. This play contains mature themes and is not appropriate for children.